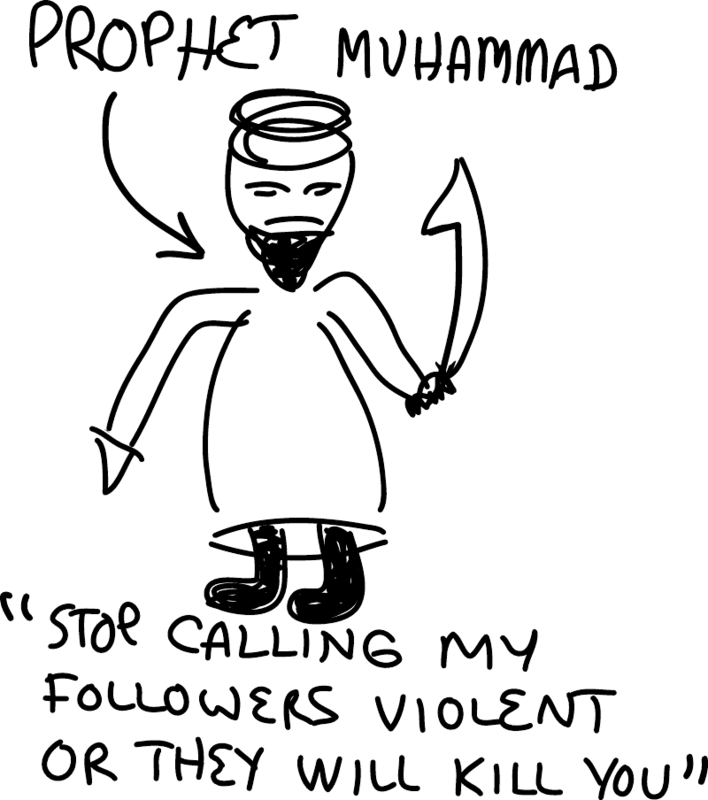 Today is "Everyone Draw Muhammad" day, so here is my cartoon of the prophet Muhammad. It's banal, poorly drawn, and not very funny. The content isn't important -- what's important is that the cartoon exists. 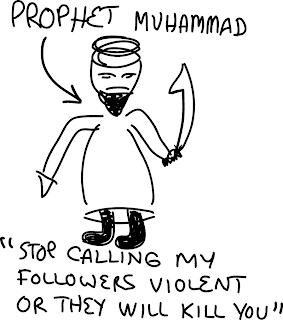 The "Everyone Draw Muhammad" day is the result of a controversy surrounding South Park's depiction of the prophet Muhammed. South Park is a TV show on cable network Comedy Central, and is some of the most interesting social commentary of our times. The creators got death threats for criticizing Islam and depicting Muhammad. The show was heavily censored by the television network, because the network was afraid of violent retribution. When I told my friends I was going support South Park, and draw a picture of the prophet Muhammed, they all reacted the same way. They were afraid for my safety. They couldn't understand why I would stick my neck out for a principle. After all, we are safely in America. There is no personal benefit to angering Muslims; nothing could be gained from this, there are only negative consequences. But it's a question of honor. When I was in college, I studied German history, especially the pre-war era and the rise of Nazism. I asked myself whether I would be one of the meek who would quietly submit to the mania of Nazism, or whether I would be one of the courageous and honorable people who vocally stood up against it saying "this is wrong!". The political issue is different today, but the question of honor is the same. Do you avoid confrontation with the bullies, the Nazi Brown Shirts and the Islamic extremists? Or do you risk confrontation to stand up for what you believe in? I can't respect myself unless I stand up for honor. I don't see a choice here. Neither did the creators of South Park. In this interview Trey Parker and Matt Stone point out that it would be hypocritical to make fun of Catholics because "they won't hurt us", but not similarly rip on Islam. They point out that the cartoonists now live in hiding, precisely because the western media back off and censored themselves. If instead western media treated Islam like everything else, if all political cartoonists supported their peers, then it wouldn't have become such a big issue, and the cartoonists would be safe. Ayaan Hirsi Ali is a well-known critic of Islam. She escaped oppression in her own country (Somalia) and got asylum in the Netherlands. She rose to become a member of Dutch parliament. She made a film about the subjugation of women in Islamic culture. Her partner in the project, film director Theo Van Gogh, was murdered in retaliation. She has lived under government protection ever since. In a recent interview related to the South Park controversy, she pointed out that she would no longer need protection if everyone freely criticized Islam. She would be safe because there would be too many of us critics to kill. The conflict here isn't between Islam and Christianity, it's between a totalitarian ideology and modern civilization. In the secular west, nothing is above criticism, insult, or ridicule. In Islam, everything is subject to ideology. In the west, we teach our kids that "sticks and stones may break my bones, but names will never hurt me". In Islam, even moderates are quick to take offense, such as in the Danish cartoons controversy. (There, of course, exist a large number of civilized non-totalitarian Muslims, I just don't see them being in the majority or setting the national tone, such as in Pakistan's banning of Facebook over this controversy). The proper response to such totalitarianism isn't appeasement, as is now common in our press. The proper response is vocal opposition and solidarity, so that the bravest of us do not have to stand alone.